Our meeting was brought to order at 7:00 PM. Introduction: Ryan Henderson, our neighborhood liaison officer. He is assigned to our neighborhood and works from 3:00 to 11:00 PM. You can contact Ryan through the non emergency number. For serious concerns, email him at: rhenderson@cityofmadiosn.com. Do Not contact him about emergencies or anything that requires attention right away. Use 911 for regular phone calls. Officer Henderson reminds us to keep our homes and cars locked at all times, keep a light on in our homes at night especially if we are not there, don’t leave keys in our cars and don’t leave mail or newspapers accumulate outside of our home. This should help deter crime. He stated that there is an unprecedented level of violence in Madison now. Resources are limited due to budgetary constraints. This is very disconcerting to the police department. He suggests that we remain vigilant of things going on in our neighborhood and keep him informed of any possible alarming activity. Captain Nelson states that we have a diverse department at this time. He has had the opportunity of being assigned to most areas of the city and is now learning the west side. Prior to serving as captain he was in charge of investigative services and internal affairs. He shared with us that violent crime is up significantly in Madison accompanied by almost daily shootings. Burglaries and theft of cars is on the rise as well. Some crime is attributed to people using guns confiscated from legal gun owners. We are now experiencing a significant heroin problem in Madison that has tripled in the last three years. This addiction is a crime driver. Additionally, we have domestic violence, some relationship patterns with crime and a Chicago to Madison link. The police need our help in noticing suspicious behavior in our neighborhood. There is now an ordinance in place that mandates homeless people with signs remain a safe distance from intersections at all times. Many people are concerned about their quality of life. The current plan for the Midtown Police Station is to demolish and break ground in August, 2017 and be completed in the summer of 2018. Make Madison Music: This event will take place on June 21. To date there are two places with venues and musicians: Bethany Church and Lucia Crest Park. Tim Gruber is a contact person for this event. Westmorland 4th of July: This will be a one day event. SVCA is donating $500.00 and wants to be acknowledged during the festivities that day. We are also looking for volunteers to help out. Neighborhood Garage Sale: The dates for this are July 28 and 29. 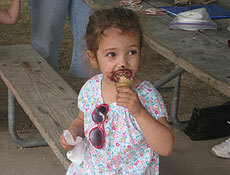 Ice Cream Social: This event will be at Lucia Crest Park on Saturday, August 5 from 1:00 to 4:00. The rain date is Sunday. There will most likely be a fire truck there as well. SVCA donated $500.00 toward this project and will place a little library there as well. Enough money was raised for the entire project to happen: new playground equipment, additional benches, wood mulch replacing the pea gravel and a natural play area with boulders, logs to climb, a digging area and 2 to 3 plaques engraved with children’s literature quotes. Construction is scheduled to begin the second week of June and take 3 to 4 weeks to complete. SVCA donated $250.00 and wrote a letter of support that helped the club win a $200.00 grant. There will be a ceremony to signal the planting and opening of the garden on July 1 at 9:00AM, Neighborhood residents are invited at attend and participate. Arvina meets with department chairs two nights a week. She said that the bids are open for the Midtown Police Station until June 15. Demolition begins August 23 and will take place from 7:00AM until 7:00 PM. They are looking into a road safety study around Blackhawk Ave. Ulrike said they need signage concerning the left hand turn onto University Ave.
Ken asked about the road construction schedule. Arvina said that there have not been any changes from the five year plan. She said she would check on the realignment of the sewer work associated with this and check on the engineering and allocation of money as well. You can contact her at: district11cityofmadison.com. 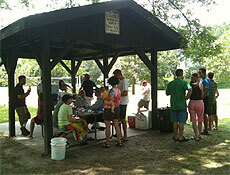 The Hoyt Park annual picnic is at the Roys Shelter on June 24 from noon until 3:00. This is a potluck event and all are invited to tour the park as well. 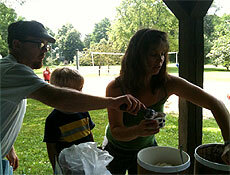 The two workdays that corresponded to Earth Day were well attended. The activities involved pulling invasive plants and picking up trash. The Madison Parks Foundation Picnic in the Park will be held in Hoyt Park on October 28, 2017. Volunteer workdays are scheduled for the third Saturday of each month through November from 10:00 until noon. Expenditures are on track and the budget was approved at the February meeting. Our current balance is $7180.45 and we owe $638.00 for the last newsletter.